An attempt to explain the prevalence of street hawking children in rural areas in Nigeria by using Ifo Local Government of Ogun State as a case study, this research is keen to explore the prevalence, determinant and implication of street hawking on development of a child and make recommendation on how to enhance the working condition for children to combine work and schooling. The study is to draw the attention of policy maker on street hawking by children and possible policy intervention that can support these children positively. The study will be focusing on group of school age children between the ages of six to eighteen. 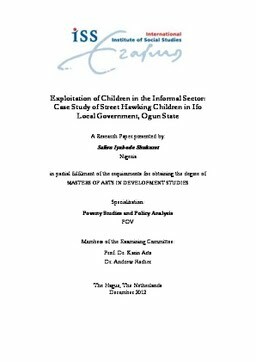 Methods: This study made use of random sampling to select five different household and purposive sampling was used to pick street hawking children that are below the age of eighteen and one community leader that tells more about the prevalence of economic working children in Ifo local government of Ogun state. Findings: the finding shows that children engage in street hawking due to the poverty level of their parents in order to finance their education and to boost the household income. These children faces a lot of challenges; some of which are long walking distance that leads to leg pains, carrying of heavy wares on their head and walk all day that results to neck pain, some are expose to environmental hazard, to mention but a few.